And so, the day of the Great A to Z Challenge Theme Reveal BlogFest dawns bright, clear, and rather warm where I live. On Feb 11, 2014 we announced the Theme Reveal BlogFest with a drum roll and a fabulous badge designed by my team mate Samantha Geary Jones aka WriterlySam and I am excited to see that 1413 (and counting) participants have signed up! 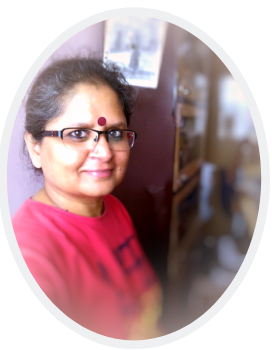 I am participating in the April A to Z Challenge 2014 with two blogs this time – this one – Vidya Sury, Collecting Smiles and my health blog Your Medical Guide. Motivated by all the discussions going on about themes and the advantages of having a theme, I wondered…to theme, or not to theme? I thought about various ideas – yeah, I am cool like that. And came up with a year’s worth of ideas. I made lists. Travel – all the places I’ve visited – I found I had covered more than one place for each alphabet! Music – limitless choice – too much that I like and very hard to confine to 26 posts! Folk tales – this was my son’s idea. He’s a big fan of folk tales and even gave me resources. Half way through the effort, my mind was so full of deeper ideas, I decided to make it a regular feature here – long term idea. Hindu Gods – again, my son’s idea. I asked if he would help me do it. He rested his case. Indian traditions – I come from a land of traditions, too many local languages and a rich cultural heritage and there is no dearth of topics to write about. Still, Um…er….after collecting loads of info and enriching my own knowledge…I decided not to go with it. Oh I will blog about it..not in April though. Food – again, lots to write about, but in keeping with this blog’s overall theme, it is better as a fortnightly or monthly post. And so, what have we here? Stop wriggling in your seats. Take that finger away from your touchpad/mouse/keyboard. Easy eh? It will be just the same as usual, except during April – the posts will conform to the alphabet for the day. I will also have the privilege of hosting some awesome guests here, during April. Incredible people I love. And I don’t want to try and restrain them into a theme that I thought up!. That looks like quite a bit, right? It is. I hoped to finish writing and scheduling the posts, but life took over and I am taking it as it comes. Or goes, depending how you look at it! Above all, my aim is to ensure that you enjoy visiting, just as you did last year and think about what you read, with a smile. If this is your first time here and you’re wondering why the ‘eck you should care about the April A to Z Challenge, here are my reflections from last year. And now, may I suggest you visit the April A to Z Challenge Theme Reveal BlogFest sign up list and check out what the others are up to? And don’t forget to MINGLE! Nice one. Looking forward to your posts. belinda recently posted…A to Z Challenge 2014 Theme Reveal! Thank you, Belinda! Looking forward to yours, too! Wow Vidya! Two blogs, you go girl! Variety sounds like a good no-theme theme. Will keep things spicy and lively here. All the very best – writing and co-hosting. 😀 Yes, Beloo! Looking forward to it, too! Don’t we all just love variety? 🙂 And since you are a star at collecting smiles I know we are in for a treat! Such kind words, Aditi! Hugs and thanks and….looking forward to your treasure chest unraveling! nabanita recently posted…A to Z Challenge Theme Reveal – A Tales Buffet! It is, Naba! I am looking forward to yours! Aww, collecting smiles. I think you win the award for cutest theme. Don’t speak too soon, Shilpa! 😀 Ok..just kidding! I am looking forward to the fun! Vidya, I should’ve guessed–diversity is our middle name, isn’t it? What a wonderful theme! Looking forward to reading every day! Guilie Castillo recently posted…The Mighty #A2ZReveal! Indeed, Guilie 😀 I refuse to confine myself to a theme! Hugs! What fun it is! That’s part of the beauty of A to Z. Some are called to a theme, others are called to something different. It’s all good. Follow your heart! Thanks to you and #teamdamyanti for co-hosting the #A2ZReveal. Y’ALL ROCK! LuAnn Braley recently posted…A to Z Challenge Reveal Blogfest! Thank you, LuAnn! Nothing is possible without support, and I thank you right back! Hugs and looking forward to rocking the A to Z! Starting to count down to the day! SMILES!! Yes, I love that idea. There is so much stress and depression in the world today. I love that you are using the a to z challenge to make the world a bit brighter one person at a time. It is my life goal, MAJK! I am so glad you are here! I’m looking forward to your posts Vidya! This sounds like a wonderful theme! 🙂 Thank you Ida! I am looking forward to reading posts from your lovely theme too! I am so predictable, aren’t I? 😀 I am biting my nails off now, because I have high expectations to live up to! 😉 Hugs! Loved your “reveal” post! Now hurry up and get well soon! I like the idea of your variety theme! And oh my another brave soul participating with 2 blogs. I look forward to having tea and reading each of your posts. I wish you the best of luck with the challenge. 🙂 Thank you Doreen! I was feeling particularly brave about the two blogs when I signed up… now I am working overtime to make sure I do a good job! And here I am wondering how I am gonna manage one blog! This should be awesome! Danny, I enjoy stretching myself. Good luck to you! And looking forward to seeing you around! 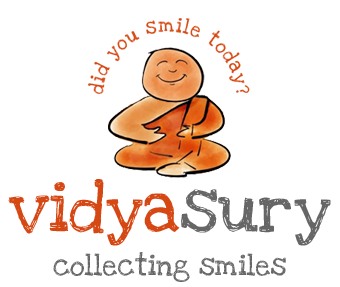 Vidya 🙂 I had to smile, what a heartwarming theme, collecting smiles 🙂 One cant collect them without scattering them so its a win-win and variety from you will be good I,m sure.2 blogs? Kudos. I like your “win-win” explanation, Sunila! 😀 Hehehe. Sometimes I am intimidated when I think of 2 blogs – but those moments are few and far between! Looking forward to doing it together! I LOVE it! Such an intriguing variety, too! Count me in:) We’ll share a cup of coffee every day in April! I am looking forward to that coffee together, Sam! I can taste it already! Ananya Kiran recently posted…Theme Revelation ! Thank you Ananya! 🙂 I look forward to reading yours too and am glad we are in it together! 😀 Thank you Patricia! In fact, Collecting Smiles is my tagline and i thought, what better theme for April? Thank you Shiva! 😀 And I, yours! Love! I’m already a huge fan of your feel-good posts.. looking forward to those and many more Vidya. Thank you, Tulika! i am so glad you are participating and I am eager to see your posts! Mary Hill recently posted…#AtoZChallenge My Theme Reveal: Drum roll Please …. Thank you, Mary! 😀 I feel the same! i am off to see what you have in store as your theme! Sivakarthik Dasari recently posted…A to Z Theme reveal! Thank you Siva! 🙂 It is such fun to see everyone’s theme, isn’t it? I am off to see yours! Bring on the smiles! I like your variety theme for April. It will be fun to see how you mix things up for all of the letters. Thanks for hosting the theme reveal and supporting such a huge turnout for the largest and best blog hop ever! Hiya Nicole! Mixing things up – is what I love doing best! And I also love movies, so looking forward to your posts! Tina Downey recently posted…#atozchallenge Theme Reveal! Hehe, Tina! 😀 Smiling is definitely good. And I did not let my son give up before I wangled two posts out of him. 😉 Looking forward to a wonderful April! Looking forward to adding to your collection of smiles in April! everybody is smiling and happy! Proactive Indian recently posted…The arrogance of inheritance? Solid win-win there, eh? I try my best, Pro! I love your theme very much. April is a month I look forward to! Ha! You convinced me to go with a theme. Next year I’ll probably be more eclectic, assuming I survive this one! 😉 Variety is always interesting! Looking forward to your posts. 😀 Debbie! You had me laughing at that! I love your theme of travel and culture. I admit I pondered over that…but variety won hands down! It has been lovely to have your smiles lighting up the group throughout the months we’ve been working together– thank you for being part of my team, for hosting this amazing reveal, and for pushing the numbers on the list! Thank you, Vidya, and all the best for the challenge! Damyanti recently posted…What is your #AtoZchallenge Theme? Here’s mine! Not without your lovely presence, Damyanti. It is a joy to be together as Team Damyanti! You, are too kind. Just get well soon! Love you! Thank you, and love you! Stormy’s Sidekicks Quackin Over Disney Geek On! Collecting smiles. …..yes, that what life is all about. I was waiting to see your theme;) I am energised after reading your post. Oh! Boy!! The amount of ideas in this one post are mind – boggling. Here I am always stuck without ideas and inspiration. Kudos to you and may you keep writing so I keep reading and loving you for it. Inderpreet, thank you! 🙂 I love your topic for the A to Z Challenge – Women. It is a great idea. I think variety is a great theme; you can write whatever inspires you for that letter based on your mood, circumstances, experiences, etc. Should be interesting to read what you come up with! Good luck with the challenge and all your duties with it! I am still getting over the fact that you had to delete your posts and withdraw from an earlier A to Z.
I am looking forward to walking with you and Koda! Aha Vidya love how you collectively call it variety. Look forward to your collection of smiles. Thank you Suzy! Looking forward to your posts, too! Variety is the spice of life! Looking forward to your amazing posts! Variety is the spice of life 🙂 You have chosen wisely, look forward to reading your posts. Great post, Vidya. You’re always so inspiring. I haven’t done much blogging for a while but you’re getting me fired up to get going on it again for the A-Z challenge. Now to think of my theme. I see I missed the March 21st deadline but hopefully I can slip in my post. If not, I’ll be there in April! Okay, now I’ve announced my commitment. GULP! This is a great idea Vidya! I’m looking forward to your variety along with all the other various bloggers I’ll be reading. And of course who couldn’t do with another smile everyday. That will be a interesting mix bag. Looking forward to your posts Vidya. Haha….well, variety is the spice of life! 🙂 Looking forward to your travel and food posts in particular Vidya! Good luck with the challenge. And hats off to you as well for joining in with 2 blogs! Hi Vidya, I hope to learn and cherish a lot from this theme of yours! Looks promising and lovely. Hugs!!! —CAN’T Wait for all of the surprises! Luv you more than coffee w/ whip cream. Vidya, can you tell me how I put up the “Like me on Facebook” thing you have on your page???????? Hugs, Kim! You know I love you too! About the “Like me on Facebook” – I am sending you an email right now. heard u are a mentor to be more precise idol to most of the bloggers.i personally didn’t get an opportunity may be.but so very much looking forward to learn from you. put me on your list vidya ji. 🙂 Thank you! I believe it is the encouragement from the community that really keeps me going, some days! Now I have to go read your post – love the title! (IFTTT…) So glad you came by! Arrrgh! Sounds like something I might do, Miss Alister! 😀 Never mind. The linky was open for three days after March 21. Mmm. Still, I look forward to connecting with you over the A to Z! 😀 Thanks for dropping by! Hello..I found your blog through the A-Z Challenge, and I enjoyed reading some of your posts. Looking forward to read more during April! Hi Madhu! Thank you for dropping by! Looking forward to connecting with you!